Home Nice Deal on the ProCo RAT2 Distortion at Amazon! 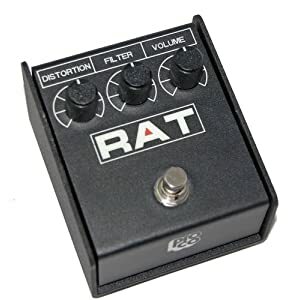 Nice Deal on the ProCo RAT2 Distortion at Amazon! If you’re into some classic distortion, then this deal is for you. This morning, I stumbled across a nice little deal on the ProCo RAT2 Distortion. This pedal lists for $134.99, and is usually available for $95, but is currently on sale for only $69.95 at Amazon. The RAT2 also ships with FREE super saver shipping as well. $25 off the going rate?? That’s pretty good! The ProCo RAT2 has the following controls – Distortion, Filter and Volume. Classic rugged enclosure with true bypass footswitch. Again, the ProCo RAT2 is currently on sale for only $69.95 at Amazon.com. At the time of this posting there were 16 units left in stock. Usually when the numbers reach the lower single digits, the prices tend to rise to their normal range. So if you want one, you might want to get on it! Thanks for the post!! I am madly in love with my Rat ProCo, brilliant tracking and live too. Highly recommend!